Besides the well-ironed suit, the leather briefcase and the swiveling chair, the smartphone has become an important part of the office. Though BlackBerry has been the de facto standard amongst office goers, its position is slowly being usurped by the ever-growing platforms like Android and iOS. The closed attitude Apple has towards its app ecosystem hasn’t allowed many office apps to flourish. Android on the other hand can proudly brag about the plethora of apps it has ready for office and productivity software users. 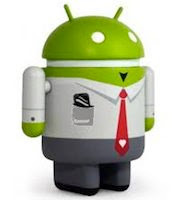 So, without much ado, here are 10 great Office apps for your Android devices. Conclusion: So, that was TechSource’s list of the quintessential office apps for your Android gadgets. If there’s any app we’ve missed out on, do feel free to mention it in the comments section. What I'm looking for is an ODT editor. Viewing is nice, but I prefer LibreOffice to MS Office. It's also supported better across the web, when will a worthy editor for Android show up?